Flownet is a lightweight drainage net used on landfill caps, tunnels and behind retaining walls and bridge abutments. It protects structures against high water pressure and is particularly well suited to vertical or steep slope drainage systems. Flownet offers an economical alternative to traditional granular drainage layers. The high flow rate of geocomposite drainage nets allow rapid drainage and reduces the hydraulic head on the liner systems. The open structure of the geocomposite drainage nets encourages gas flow, allowing effective, controlled discharge of the gases. 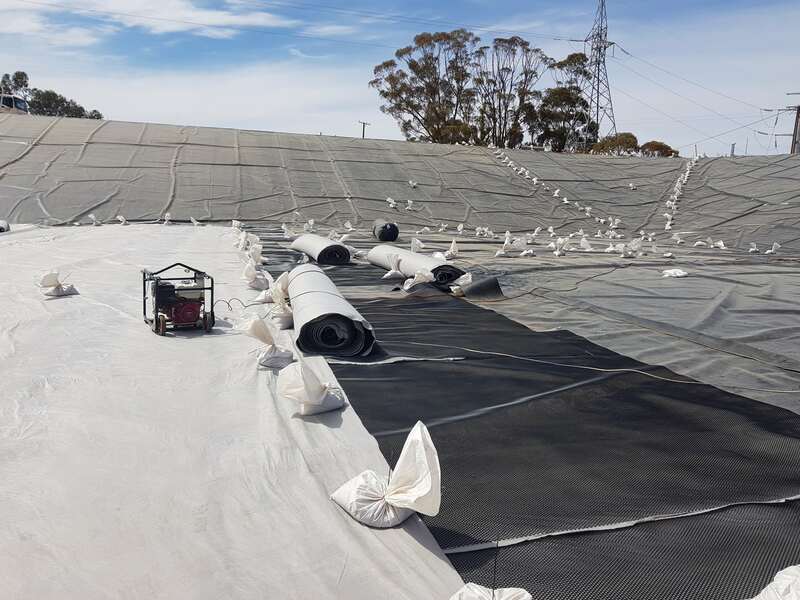 The thick, tough matrix of the geocomposite drainage nets provide a light-weight and durable protective layer around the outside of landfill drainage systems or pipelines. Flownet biaxial geocomposite drainage nets are used to replace thick gravel drainage layers when capping landfills or waste containment structures. The light-weight drainage net can be easily and quickly installed and allows rapid drainage of liquids and gases associated with waste containment structures. The Flownet biaxial drainage net is used behind retaining walls to replace traditional vertical gravel drains. The drainage net dramatically reduces the hydrostatic pressure on the wall. The option of incorporating the plastic geomembrane prevents water from reaching the retaining wall, which ultimately extends the life of the structure and prevents the appearance of a damp face on the retaining wall. Flownet is a reliable alternative to traditional granular systems used to collect gases in landfill operations. Thanks to its low transportation and installation costs it’s also very cost-effective. The lightweight Flownet drainage system ensures the water used to irrigate the rooftop garden is removed as quickly as possible without damaging the adjacent structure. The Flownet biaxial drainage net provides a thick protective layer around the outside of the pipes, reducing the need for fine grained soil backfill as the protective layer (which can be expensive and difficult to source). The geonet core limits impact damage or puncturing forces from the coarse aggregative backfill. Flownet biaxial drainage nets are made from lightweight high-density polyethylene (HDPE). They have a thin design and composite construction. Flownet offers a cheaper alternative to traditional granular drainage layers. It is easy to install and highly durable. The use of Flownet geocomposite drainage nets is well accepted, however the replacement of aggregate drainage systems with drainage nets should be carried out in accordance with well defined design parameters. Geofabrics offers technical support and information for detailed evaluation and design of geocomposite drainage nets, including the testing of the drainage net with your site specific materials at our Geosynthetic Centre of Excellence.